TANGUAY Machinery is introducing a new high performance broom sweeper by second quarter of 2011. The company claims unique operation will save users between 50% and 75% in operating costs on highway sweeping projects. TANGUAY management offered WorldSweeper.com readers an exclusive sneak preview of the machine. TANGUAY representatives emphasize the ability of their upcoming ARSENO M300 front-offload broom machine to sweep more quickly than others currently in the market. Plus, it is continuously offloading into a dump truck during operation, so there's no downtime for dumping or transport. As a result, says TANGUAY's Sales and Marketing Manager Jean Pelletier, users can expect a measurable productivity increase on highway and other major street sweeping projects. "Our upcoming TANGUAY ARSENO M300 front off-loading sweeper has already been through strenuous testing and has shown itself to be a rugged unit with lots of power," said Pelletier. "This unit can sweep at speeds better than 11 mph while continuously loading into the truck. This allows the unit to be almost 100% efficient, as long as there is the required number of trucks to take the material away from it." According to Pelletier, the newly developed ARSENO M300 has patent-pending features not available on any previous sweeper models. The M300 unit is currently operating in Quebec, Canada to what he says are outstanding reviews. "The M300 is the best system for sweeping highways and any area where you need to do the sweeping in a record time," Pelletier said. "Also, most of the time, you will not have to shut down the road when sweeping. "The M300 is designed and tested to meet all of the new standards for environment (PM10, noise, operator safety and ergonomics, EPA 2010 engine emission control and performance. The operation of the ARSENO M300 sweeper is very different from your usual way for sweeping highways. Since this unit is using a front-offloading conveyor, we need to always have a dump truck available to take the material away. "In order to be able to operate at higher speed, we need to wet the area and also ensure that the job is completed by a high-efficiency (regenerative air, vacuum, etc.) sweeper in order to guarantee top quality sweeping. The 'finishing sweeper' is only required when the M300 is operated at high speed. "We have performed major sweeping jobs and reduced the time by one fourth or better, compared to a team of 4 to 6 popular street sweepers. We also can perform the sweeping without the need for closing down the highway, bridge or tunnel. The system needs to use only one lane, with the use of a second lane only for shifting dump trucks, there is usually no need for shutting down any section of the highway. This represents a great economy with traffic control." This sweeping project was normally done using six (6) mechanical street sweepers on night shift only, which required the use of two (2) front-end loaders and one skid steer, plus a water truck and the required number of dump trucks. Prior sweepers needed a complete tunnel closure with all of the associated planning and cost for traffic control. Total time for the project was four night shifts of seven hours each for completion. Using the TANGUAY-ARSENO M300 team, the whole project was completed in only one (1) night shift (7 hours), using the M300 highway sweeping team as described above, without having to shut-down the tunnel. This project was performed using the same team as for the Lafontaine tunnel and total time previously needed was eight night shifts. During sweeping, each section of highway needed to be shut-down. Using the M300 team, the whole project was completed in only four night shifts, with the sweeping taking a total of 35 hours, using the M300 highway sweeping team as described above. None of the highway needed to be shut down. The basic weight of the ARSENO M300 with no options is about 16,000 lbs (7,260 Kg), and power is via a diesel-powered Cummins ISC 330hp engine with 1,100 ft.lbs. torque @ 1400 rpm. 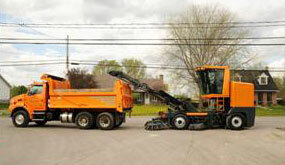 The sweeper boasts a capability of sweeping and offloading up to two metric tons per minute into a leading dumptruck. The purpose-built chassis has a traveling speed of up to 50 mph (90 Km/hr). For more information, you can take a look at the machine's PDF brochure. 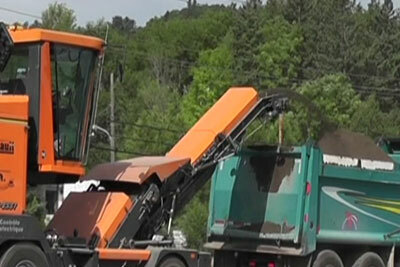 According to Pelletier, owners will be able to save between 50% and 75% in their operating costs for highway sweeping projects, subject to each specific operation, with a safer operation on streets and highways. 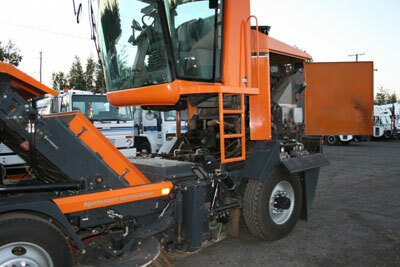 For additional information on TANGUAY or its upcoming ARSENO M300 sweeper, call 800-463-9856 or visit www.tanguay.cc.